Every year this time we receive a gift. They show up like clock work. to ponder how they come to be? 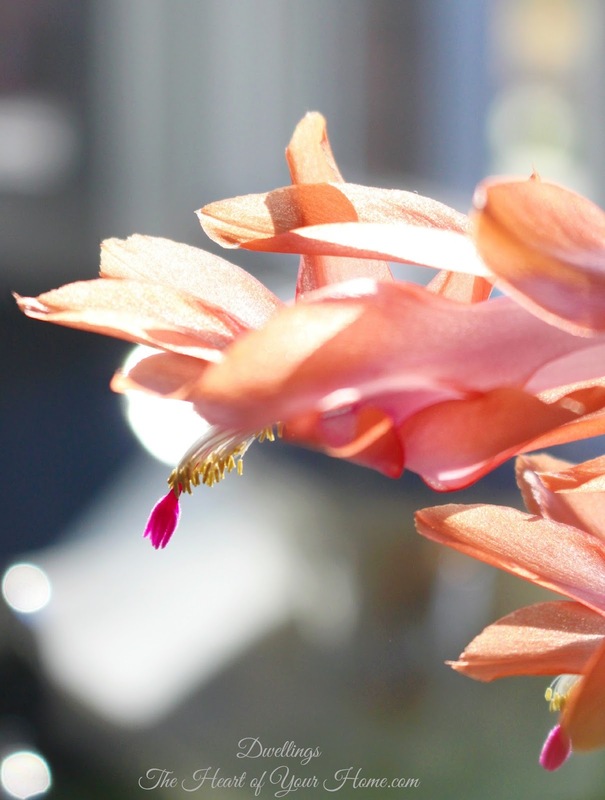 Are they Christmas or Thanksgiving Cactus? I've read the way to distinguish between the two is to look at the shape of the flattened stem segments. 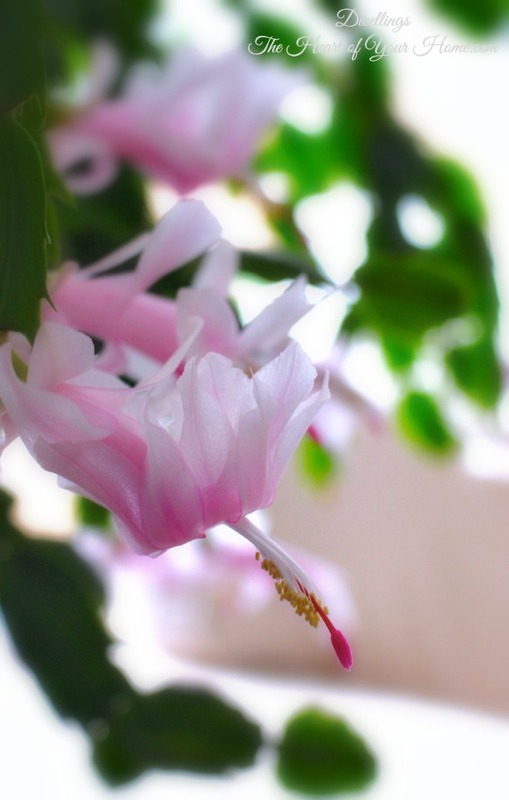 On the Thanksgiving cactus, the stem segments each have 2 to 4 saw-toothed projections. 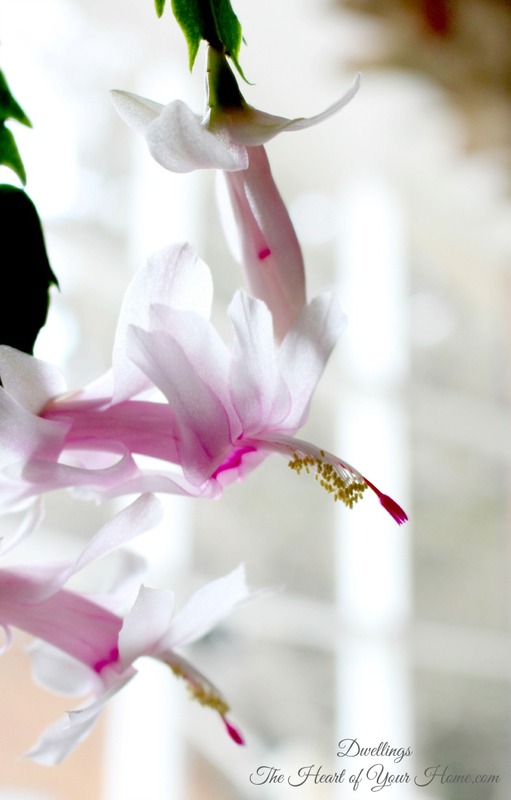 The stems on the Christmas cactus are more rounded. The flowers trail so I keep them elevated on pedestal dishes and cake stands. What do I do to receive this special gift year after year? and then in late fall when the temperatures start to fall I move them back indoors for the show to begin! I know what you mean, Cindy. I posted about this very thing last year! 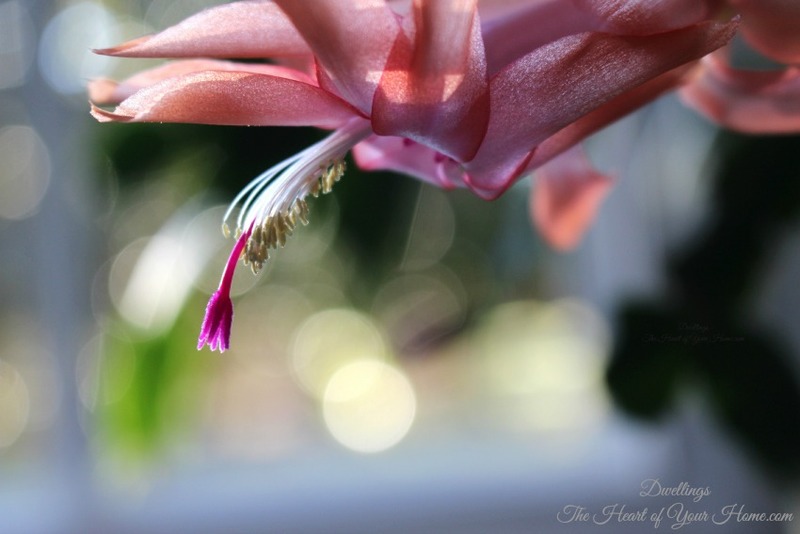 They should be called Thanksgiving Cactus...I even had one that started to bloom around Halloween! All of mine are in my office window sill at work...I have three...one was just given as a gift in full bloom last Christmas and there is not a bud or bloom in sight on it! The other two are in different stages of bloom this very moment. 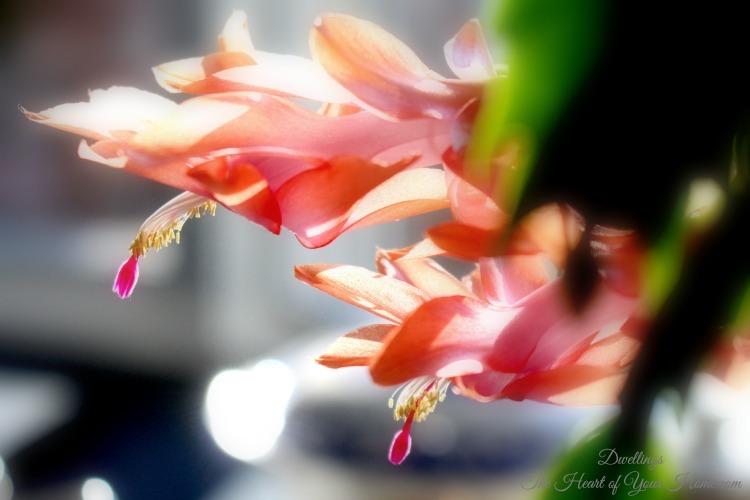 There is nothing quite as heavenly looking as that bloom, is there? Don't want to leave without telling you your photos are just stunning! Wonderful pictures of a wonderful gift! And a wonderful post for calming down! My step-Mom gave me one of these 3 years ago and it is amazing every year. It is so full of buds right now and in another week it will be in full bloom. Just beautiful! Mine is a Christmas catus. Yes, your pictures are beautiful! You have reminded me of my parents. They each had different varieties that they called their own. 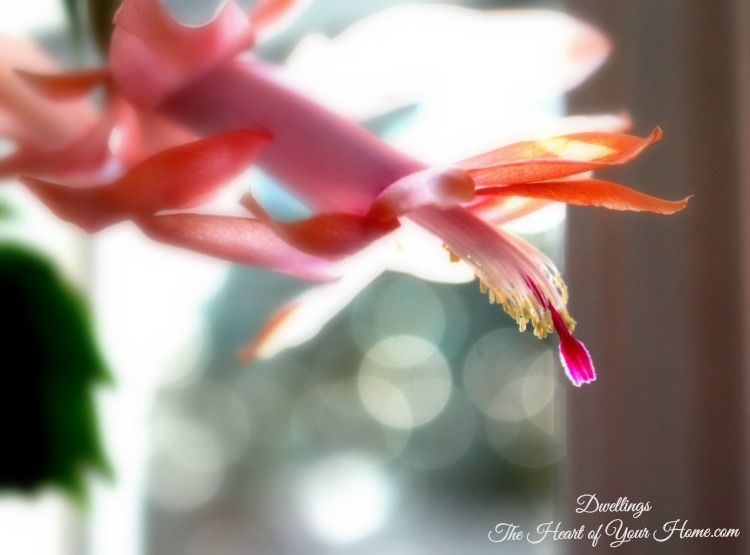 In all my years now in a home of my own I haven't grown Christmas or Thanksgiving cactus. I think there is a Mother's Day or Easter one too. Not sure. Your photos of them are exceptional. Thank you for the tip about how to tell the difference between the two varieties and to elevate pot on a compote or cake stand. Great idea. Found you from Common Ground. Those are lovely and something great to enjoy during the cooler months. So pretty!! They grace your lovely new kitchen beautifully! Thanks for telling us how to tell the Thanksgiving and Christmas cactuses apart. I've always wondered. Cindy, your Thanksgiving cactuses are just lovely! These have always been a favorite plant of mine; my mom has had the same one for years (it's pretty big). 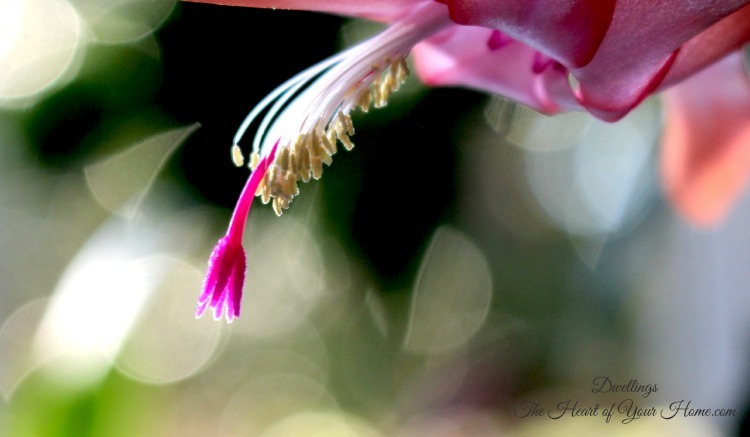 :) Your photography really is amazing -- I'm always so impressed with your closeups and nature shots. These pics are especially awesome. 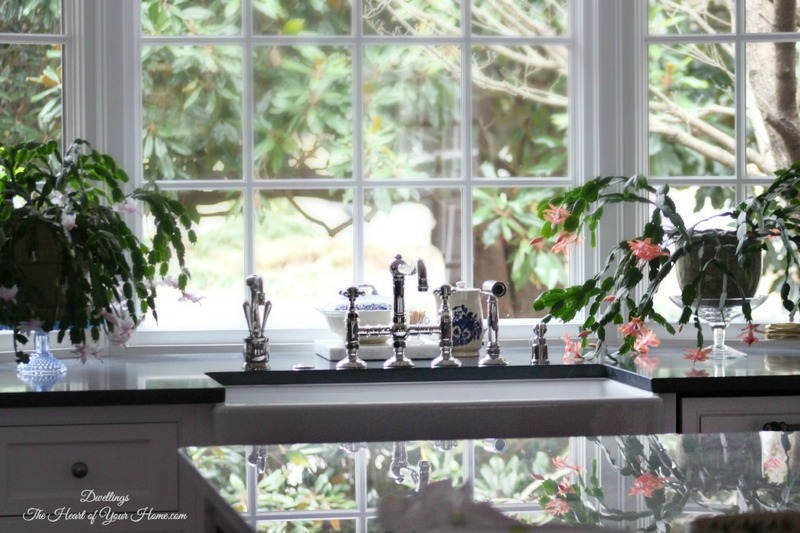 :-D The cactus plants look sooo pretty in your wonderful new kitchen, Cindy! Those flowers are amazing and I love their soft colour. They're gorgeous blooms! I didn't realize there was a Thanksgiving variety. I haven't had one of these in years. So pretty~ Thank you for joining Home Sweet Home!